The Alpha Word Game System is based on the original deck of Alpha Playing Cards, which was first conceived in 1994 and self-published in 1997 by Tim Schutz aka tjgames.com. 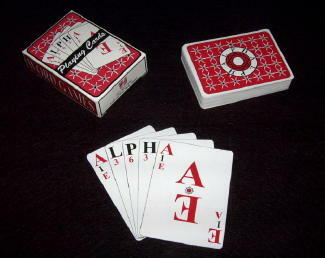 The new Alpha Playing Cards have the marked vowels, the original Alpha Playing Cards only had the semi-wild vowels; the idea for the marked vowels didn't come till several years after the first publication and wasn't added to the deck until the 2011 release of the Alpha Word Game System. The new Alpha Playing Cards has the addition of the 9x9 grid on the backs of the cards, so that the cards can be used to create boards for the tiles and dice. The original deck of Alpha Playing Cards has won three awards, Learning Magazine 2001 Teachers' Choice Award, Parent to Parent 2006 Adding Wisdom Award and Creative Child Magazine 2006 Game of the Year Award.